We’ve all been there. Rush hour traffic, incinerating temperatures, and our responsibilities in mind all make for a stressful ride, any time of the day. Unfortunately, we can’t necessarily control our external stressors, but we can control how we react to them. Today, Bartow Ford, the one-stop shop for Ford Lakeland, FL residents, is going to share a few ways you can take advantage of Ford technology to de-stress your driving and have a better driving experience. Let’s take a look! With the Pre-Collision Assist package in your Ford, you’re going to have a little bit more peace of mind as you travel throughout the state. This advanced system even has a feature known as Pedestrian Detection, which helps you avoid colliding with pedestrians and will slow down your vehicle if it detects that a frontal collision is imminent. Although you are not to rely on this system entirely, it is certainly a great feature to help you relax a tad bit more. When we’re stressed out, our ability to pay attention is diminished. Ford aims to help catch you when you might have slipped up with the Lane-Keeping System. It will detect and alert you when you’ve drifted lanes, giving you a gentle reminder that you should focus and concentrate a bit more on how you are steering. Again, this system is only an extra set of eyes, not a replacement for your undivided attention. A nightmare for many of us is parking our vehicles in tight spaces or where we might not be able to see clearly. The Park Assist System aims to change that. 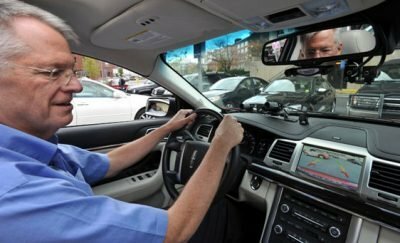 By providing you guidance through the dashboard and with camera systems, as well as special control during parallel parking, you will now be able to make complicated parking a breeze. You’ll no longer have to worry about this one small, yet incredibly aggravating, daily struggle. 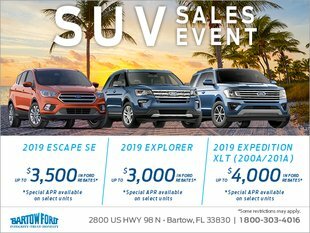 Bartow Ford reminds you that these features are all available in the newest Ford Lakeland, FL vehicles we have in stock. Come check us out on 2800 US HWY 98 North every Monday through Saturday! If you can’t make it to our dealership, get started with your search online.